A group of dedicated and determined radio operators are headed for Wake Island in early October 2013 for a rare opportunity to transmit from this toehold of land in the mid-Pacific. 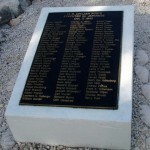 The Wake Atoll Commemorative DXpedition is “dedicated to preserving the memory of the Forgotten 98 . . . who lost their lives on Wake Island on October 7, 1943 during World War II.” The operation, observing the seventieth anniversary of their deaths, honors these men, their contributions, and their sacrifice, and is dedicated to keeping their memory alive. As a Wake Family member, I am deeply grateful for the expedition’s commemoration of the 98. Amateur radio operators hold a special place in the hearts of many families of captured prisoners during World War II. They were the first to pick up confirmation that individuals were alive and to convey that welcome news to families at home. Sadly, none of the 98 would have an opportunity, but many of the other Americans shipped off to POW camps in China and Japan were able to record messages on Japanese radio early in their captivity, giving their names and the addresses of family members and sometimes a short message. Across the United States and in Canada, ham radio operators picked up the transmissions, wrote down the information, and sent letters, telegrams and, if possible, telephoned the anxious families of the missing men. During my research for Building for War I came across many references to such contacts in letters, local newspaper articles, and family stories. The first transmissions from Japan came when the Nitta Maru, carrying 1,235 military and civilian prisoners from Wake Island, docked at Yokohama in January 1942. “Not at liberty to speak freely the prisoners took different tacks to convey their conditions and reassure their loved ones. In a message addressed to his wife Dan Teters [CPNAB general superintendent] said, ‘I am being well treated by the Japanese and everything is going along as well as could be expected.’ (Building for War, 253) Later Japanese radio station JOAK dispatched crews into the prison camps to record messages, and photographers for the Japanese propaganda magazine Freedom photographed groomed prisoners speaking into the radio sets. Propaganda aside, the names and voices picked up by amateur radio operators thousands of miles away and relayed to families were gifts that brought “mixed emotions of joy and fear.” Sons, husbands, and brothers were alive . . . but prisoners in unknown locations and unknown conditions. For many families, there was no word at all as the months stretched into years. Ham radio operators monitored radio broadcasts from Berlin as well as Tokyo. In her 2007 book, World War II Radio Heroes: Letters of Compassion, author Lisa Spahr relates how she discovered more than two dozen letters and postcards sent by radio operators to her great-grandmother in 1943, alerting her that her son had been captured in Germany. Spahr made it her mission to find out about the kind-hearted strangers who wrote the letters and to reach out to them and their relatives. Some of the wartime radio operators wrote literally thousands of letters. Likely some of them are still tucked away in other attics. While the U.S. government banned radio transmissions by amateur radio operators during World War II, that didn’t mean they couldn’t listen. Suspicious of their motives and the negative effects that Axis broadcasts could have on morale, the government discouraged the wartime monitoring of POW broadcasts. The listeners might be swayed by deliberate inaccuracies, deceptive propaganda, or worse, be drawn into covert activities. Still men and women sat by their sets, acutely aware of the vital link they provided for families during those dark days of war. Some organized groups and schedules to ensure round-the-clock monitoring so that no transmission would be missed. Thank you, DXpedition, for honoring the 98 with your mission. Good luck and Godspeed!